For part 1 of the Bijo Gaku recap “Maimi’s canned food genius”, please click here. Maimi and the girls (Captain, Maasa, and Mai) were back again for another week of studying canned foods for the “Extracurricular Lesson” segment of “Bijo Gaku”. This episode picks up right where last week’s left off, and the girls were given another canned foods quiz. 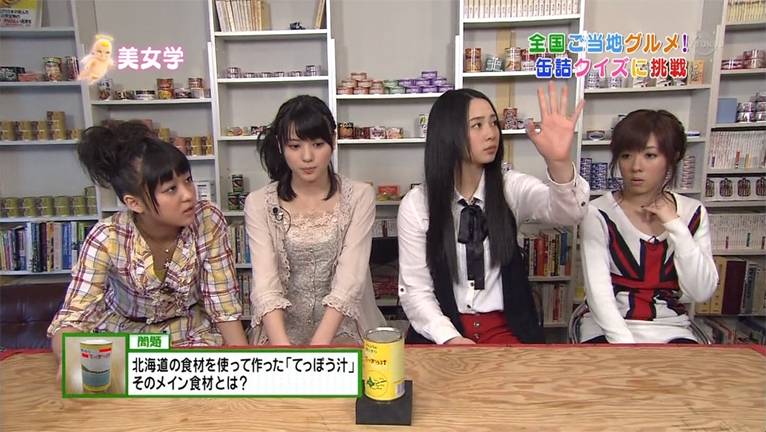 Their teacher, canned foods expert Kurokawa Hayato, brought out a can labelled “Teppou Jiru” and asked the girls to guess the main ingredient with the hint that it’s something famous from Hokkaido. Maasa instantly and correctly guessed “kani” (Japanese for crab), and as a result was presented with a piping hot bowl of “teppou jiru”. Unsure how to eat it initially, as the crab meat was still in the shell, Maasa shook a piece until the meat simply fell out. Captain asked why it was called “teppou jiru” (“teppou” is gun, “jiru/shiru” is soup), and Kurokawa explained that the motion for digging out the crab meat is similar to how guns used to be loaded a long time ago. Onto the next question, Kurokawa presented the girls with a can that read “Ra Furansu” (“La France”, a special kind of pear from France). After Kurokawa verified that all of the girls knew what “ra furansu” was, he challenged them to draw a picture of one. The girls revealed their drawings one by one, and Kurokawa declared Maimi and Mai the winners and gave them each an assorted fruit bowl containing “ra furansu”. However, as Maasa and Captain pointed out, both of them went for other fruits first, with Mai eating the peach and Maimi eating the cherry. It was then time for Kurokawa to introduce them to another canned food that goes well with rice, this time bringing out a can of mackerel. While opening the can, Kurokawa mentioned that mackerel and sardines are both rich in EPA (eicosapentaenoic acid) and DHA (docosahexaenoic acid). None of the girls seemed to understand what he was talking about, and Mai commented that it sounded like TPO (time/place/occasion). As Kurokawa was taking the mackerel out of the can, the girls expressed their amazement at how big the pieces were and how many were in the can. For this dish, dubbed “Sappari Saba Donburi” (simple mackerel on rice), the mackerel is first covered in a Japanese sauce made of soy sauce and citrus juice, then extra virgin olive oil, and is then topped with black pepper and placed on top of rice. Much like last week, there was only three bowls of rice on the counter. To decide who’d get to eat the “sappari saba donburi”, the girls once again had to play rock-paper-scissors. This time, all the girls went at once and Captain won herself the first bowl by beating everyone else’s scissors with her rock. This left Maimi, Maasa, and Mai to challenge each other for the remaining two bowls, and much to Maimi’s shock, she lost and was excluded from the meal, despite her certainty that she was going to win. As the other girls enjoyed their meal while Maimi looked on, Captain tried to comment on the extra virgin olive oil, but stumbled on the pronunciation and instead said “extrura oba”. Maasa took no time in eating all of the mackerel and showed off her bowl that had only rice in it, but Mai, who had been excluded from most of the meals up to this point, one-upped her and showed off her completely empty bowl. Maimi, Captain, Maasa, and Mai will continue their canned food studies on next week’s episode of Bijo Gaku (airing on 3/17). Posted on March 10, 2011, in Recaps and tagged Bijo Gaku, Hagiwara Mai, Shimizu Saki, Sudou Maasa, Yajima Maimi. Bookmark the permalink. 4 Comments. her reaction to losing the jan ken pon is priceless… she was so confident she would win! poor maimi! Maimi does have a real talent for drawing, so it’s no surprise that she had the best looking one. I remember seeing a picture once where she drew a picture of all the Kids members (I wish I could find it again), and it was so spot on that you could easily tell who was who, a challenge sometimes with the other girls’ drawings. And yeah, her reaction was the best. Perhaps she got overconfident because she had won almost all of the challenges, or she was comfortable with the 1-in-4 odds, but regardless, seeing her sincere reaction and the camera zooming in was hilarious. I do feel bad for her though, as it seemed she really wanted to try it. At least she knows how to make it now, and I’m sure she’ll try! but good point about her making it at home… i’m sure she would try to make these dishes at home to share with her family.